With the FA set to investigate Jose Mourinho's touchline comments after Manchester United's win over Newcastle, Sky Sports looks at his previous sanctions from the governing body. 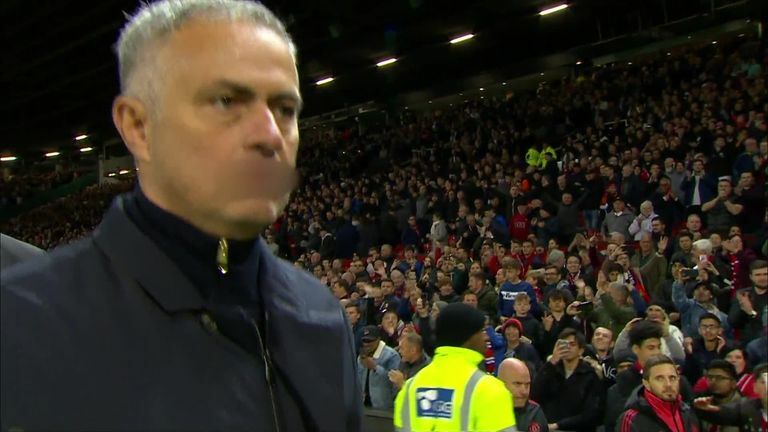 Mourinho was caught on camera as he left the pitch at full-time at Old Trafford following his side's last minute 3-2 win last weekend, appearing to speak in Portuguese, and could face a touchline ban if he is found to have used 'offensive, insulting or abusive language'. The Portuguese has been sanctioned on numerous occasions over his three spells in the Premier League, twice with Chelsea and now with current club Manchester United. With this latest incident now being investigated, we look back on Mourinho's disciplinary record during his time in England, with fines from the FA amounting to £295,000. In January 2005, he was fined £5,000 for accusing Manchester United of cheating after the first leg of their League Cup semi-final. A different governing body on this occasion but, two months later, he was fined £8,900 and handed a two-match ban by UEFA after Chelsea's 2-1 loss at Barcelona when he claimed he saw then-Barca boss Frank Rijkaard speaking to referee Anders Frisk. In August 2005, he was handed a £75,000 fine, reduced from £200,000, for his part in Ashley Cole's controversial transfer from Arsenal to Chelsea. Mourinho was also sanctioned heavily during his second spell in charge of Chelsea after returning to the club in 2013. In October 2013, he was fined £8,000 after being sent off by referee Anthony Taylor in Chelsea's 4-1 win over Cardiff, while a month later he was fined £8,000 again after being sent to the stands by referee Chris Foy during a Chelsea loss at Aston Villa. After Sunderland inflicted his first home Premier League loss as Chelsea manager in April 2014, Mourinho was fined £10,000 for sarcasm towards referee Mike Dean. In December of that year, Mourinho complained of a "clear campaign" against Chelsea after Cesc Fabregas was denied a penalty at Southampton and, despite contesting an improper conduct charge, he was fined £25,000. Later that month, he was banned for another game and fined £40,000 after admitting an FA charge of misconduct following an incident with referee Jon Moss during his side's defeat to West Ham. In October 2015, he was fined £50,000 and handed a one-match ban after saying referees were "afraid" to give Chelsea penalties. The 55-year-old was charged three times in the space of six weeks by the FA in late 2016 and received a fine on each occasion. He was fined £50,000 for comments made about referee Anthony Taylor ahead of Manchester United's goalless draw at Liverpool before being given a one-match touchline ban and £8,000 fine following an incident with Mark Clattenburg during United's draw with Burnley. Shortly after that he was banned for one game and fined £16,000 after being sent to the stands by Jon Moss for kicking a water bottle against West Ham. Mourinho has incurred the wrath of different organisations during his spells in Spain with Real Madrid and in Serie A with Inter Milan. In February 2010, while in charge of Inter Milan, Mourinho received a €40,000 fine and a three-game ban after making handcuff gestures during a draw with Sampdoria. Inter had Walter Samuel and Ivan Cordoba sent off, and Mourinho was convinced there was a refereeing conspiracy against his side. In November that year, after taking over at Real Madrid, he was fined €30,000 and handed a one-match suspension by UEFA after Xabi Alonso and Sergio Ramos were found guilty of improper conduct by deliberately picking up yellow cards against Ajax in the Champions League. Mourinho was also fined €50,000 and given a five-match European ban, with the fourth and fifth games suspended on appeal, after comments he made following the Champions League semi-final first leg against Barcelona at the Bernabeu in April 2011.